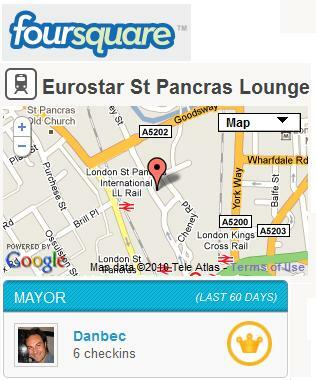 I wasn’t expecting this, but after a few check-ins I’ve already become Mayor of the Eurostar St. Pancras Lounge on Foursquare. I guess that’s what happens when you commute frequently on the London-Paris route. The only glitch is that … there are actually 5 different venues on Foursquare called Eurostar Lounge Something! I guess I’ll have to remember check-in on all 5. Now I am obviously trying to become Mayor of the Paris lounge too, but it looks harder, someone else’s already there, but in 2 weeks I am planning to get more check-ins and steal the title. No, this is not serious. Update: the location has been removed from Foursquare, most likely there was a duplicate, so I’ve been dumped. But I’m on a good track and should grab a new mayorship soon. I think Amex Platinum still works, I can ask directly next time I’m there in a couple of weeks.